The teacher selects challenging text excerpts and photocopies the text in the middle column. On the left, students write a statement for the gist of the text that helps the student write a more complete summary below it. 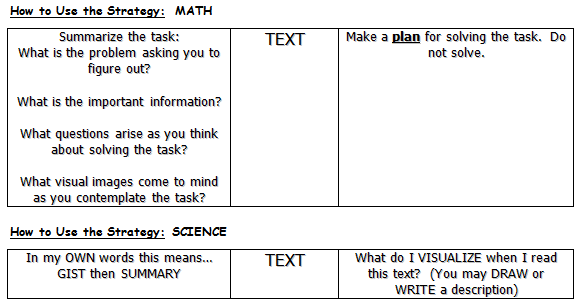 Questions may be used to help guide student thinking. One the right, students pay attention to their thinking and record the reading comprehension strategies they used to make sense of the text. As a result, teachers know whether or not students understood the content.